L’Assemblée Générale de la Fédération des Sociétés d’Anciens de la Légion Etrangère s’est parfaitement déroulée dans la salle mise à disposition par le chef de corps du GRLE le lieutenant-colonel Yann Doutey au fort de Nogent le jeudi 8 juin 2017 à 09 h30. Un compte rendu de cette importante réunion annuelle fera l’objet d’un article détaillé dans notre prochain « Echo de la FSALE ». De nombreux points figurant dans l’ordre du jour ont été évoqués, parfois avec une petite dose qui fait montre de l’intérêt portée à ce genre de manifestation par nos Anciens. A retenir l’excellente ambiance qui régnait, la journée se terminait par un repas convivial ponctué de chants légionnaires à l’image de ce qui se fait traditionnellement lors de toutes nos réunions qui regroupent les Anciens légionnaires. A ne pas douter, un grand moment de fraternité légionnaire. The skies above RAF Scampton will be coloured red this September as the legendary Red Arrows are named among the first display aircraft to confirm participation at the inaugural Scampton Airshow, in Lincolnshire. Reinforcing its commitment to the new airshow, the Royal Air Force has announced that the nine BAE Systems Hawk T1/T1A jets, which comprise the world-famous Red Arrows, will be a prominent feature at the Scampton Airshow, alongside flying displays from some of the Service’s most dynamic and iconic aircraft. Spectators will be treated to the trademark combination of close formation and precision flying from the world’s premier aerobatic display team as they will be performing over their home turf under the leadership of Sqn Ldr David Montenegro. Paul Sall, Airshow Director, said: “We are thrilled to announce the Reds as the first aircraft in what I’m sure will be a great line-up for the debut Scampton Airshow – there really could be no one else to kick it off. Joining the flying display line-up will be leading multi-role combat aircraft, the RAF Typhoon FGR.4. Displayed by Flt Lt Ryan Lawton of 29(R) Sqn, the Typhoon, from RAF Coningsby, is capable of being deployed in the full spectrum of air operations, and is set to thrill spectators with its incredible agility and power. As it celebrates its 60th anniversary, the RAF’s Battle of Britain Memorial Flight, will display five of its most famous and successful WW2 aircraft. Crucial to the Dambusters raid, spectators will be able to enjoy the evocative sight and sound of the Lancaster bomber, as well as that of four BBMF Spitfires. The RAF Falcons Parachute Display Team have also confirmed they will be joining the Scampton Airshow line-up with a jaw-dropping free fall performance. The Falcons, fronted by Officer Commanding Flight Lieutenant Simon Owen, are one of the world’s leading free fall display teams. Their exciting demonstration, which includes advanced manoeuvres, canopy skills and falling at speeds up to 120mph, promises to be a highlight for thrill-seeking onlookers. Paul Sall continued: “When discussions were in progress surrounding the RAF’s commitment to a new airshow, it was agreed that RAF Scampton was the ideal place to host it. Not only does the station hold so much history as the base of the legendary 617 ‘Dambusters’ Squadron and the venerable Vulcan, but there is also a huge appetite for an airshow in Lincolnshire. Through the BBMF and various ground displays we’ll be looking to reflect this county’s rich aviation heritage. The Scampton Airshow, staged in support of the RAF Charitable Trust, will take place from 9-10 September at RAF Scampton. Visitors to the show will witness an impressive five-hour flying display, complemented by an array of entertainment on the ground, from a nostalgic Vintage Village through to interactive and engaging STEM exhibits in the Techno Zone. 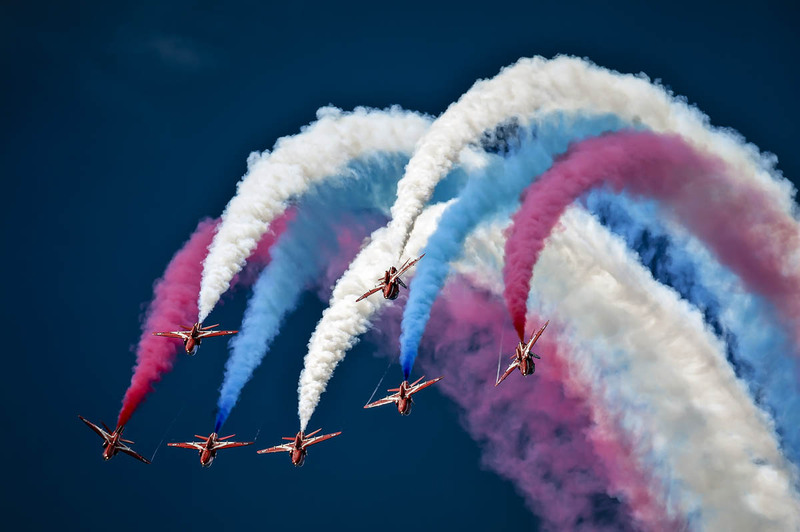 The home of the airshow, RAF Scampton, has played key roles in the First World War, Second World War and the Cold War and is today the home of the world famous RAF Aerobatic Team - the Red Arrows. First known as Home Defence Flight Station Brattleby, the airfield was first opened on 13 October 1916. The airfield was home to many different types of First World War fighter aircraft including FE2bs and Sopwith Camels. In 1917 the airfield was renamed Scampton. The Royal Air Force Charitable Trust's mission is to PROMOTE the Royal Air Force, to SUPPORT its people now and into the future and to ENCOURAGE air-mindedness and the aviation-related education of youth. The Royal Air Force Charitable Trust has already gone a long way to encourage aviation-related education to the youth in Lincolnshire. In 2016 alone it has granted thousands of pounds to fund Families Days at RAF Digby, RAF Cranwell and RAF Coningsby as well as a Science, Technology, Engineering and Maths (STEM) event at RAF Scampton.